Our little ones love going on picnics, whether it is going to the park, Legoland or simply in our garden and this LeapFrog Shapes and Sharing Picnic Basket encourages them to enjoy role play at home. They lay out the little table cloth, have a plate each and share out the food. This encouraged them to learn what the food is, what shape it is and helps with their fine motor skills to place them in the correct shape within the plate. The LeapFrog Shapes and Sharing Picnic Basket is so colourful and inviting that it keeps them entertained for a long time. Once they have finished their picnic then they can tidy up and it helps that the picnic basket sings to them, and they can sing along to the songs. 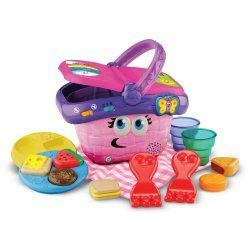 We use this toy with their Fisher-Price Laugh & Learn Say Please Tea Set and then they can pour a cup of tea as well. 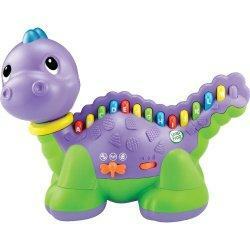 This robust and fun Leapfrog Lettersaurus is a great toy really from six months plus. All little ones love pressing buttons and this toy really encourages that whilst encouraging their fine motor skills. This toy started helping our son to learn his colours, we used to ask him to press different colours, but it also later on encourages them to sing and learn the alphabet. It is a sturdy little toy which can provide hours of fun. The Orchard Toys At the Stable is a very detailed and interesting puzzle and was a gift for our little boy on his birthday. It has 75 pieces and admittedly he cannot complete this one on his own yet although I am sure he will be able to do so very soon. 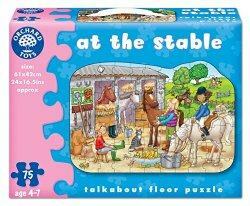 I encourage him by asking him questions about different areas of the puzzle, for example, where is the brown horse? What does he eat? Where are his Rosettes? and from there I get him to look for the pieces and we piece it together. He really enjoys this even though it is a large puzzle. It is so detailed and I think even children who don’t know anything about horses will enjoy this fun all inclusive puzzle. This will definitely be a long lasting puzzle and as always the quality of Orchard Toys Puzzles is great so I know it will with stand toddler handling. As we started our son piecing together puzzles at an early age, his interest has grown with the help of Orchard Toys, as their puzzles are so attractive and unique. This Orchard Toys Big Dinosaur puzzle is no different, stretching his learning skills he can now complete this puzzle on his own. He pieces together the different dinosaurs first and then works to piece the whole puzzle together. This Orchard Toys Big Dinosaur puzzle not only teaches them how to piece together more pieces but also the names of dinosaurs, he can now name most of them. Having the dinosaurs in strong, different, vibrant colours keeps their interest for a lot longer. The Orchard Toys Police Car Puzzle has 30 pieces. Our son loves this puzzle, possibly his favourite. He can now piece it together on his own and then describes all the different police people and their vehicles. 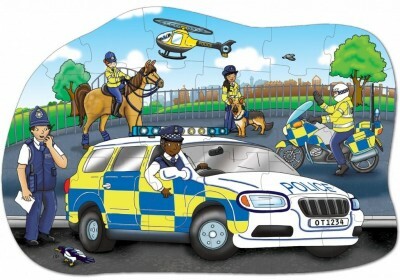 This puzzle is different as it teaches the children that not only do the police drive in cars, they also have dogs, motorbikes, walk around on foot, horses and even helicopters. 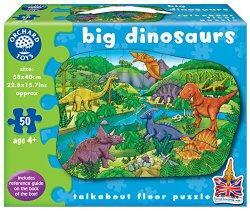 Orchard Toys have really excelled in this puzzle as it really is teaching the little ones world understanding.